The vlookup command can be used to search for a certain string of data in Excel, and then return a related string of data. Let's take an example of a breakfast menu. Vlookup can be used to find the price of a certain item. In this example, vlookup is used to search with the string of data in cell B8, which is pancakes in this example. 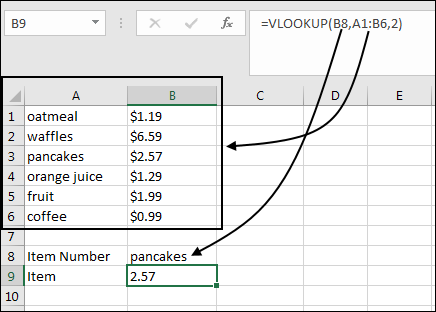 Vlookup will search cells A1 through B6 for the work pancakes. If a result is found, the second column that contains the word pancakes will be displayed in the search results.